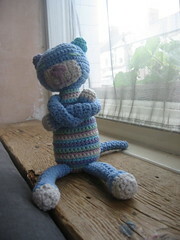 my pellets arrived today so i finally got round to stuffing and finishing my amigurumi cat. i’m very glad i crocheted so tight (dk yarn, 3mm hook) as the pellets are pretty small and could probably come out through the fabric if i’d used a standard hook for the yarn. to keep the pellets in the end of the limbs, since they aren’t stuffed, i stitched across the openings where they narrow (not tightly, just to make a kind of spider’s web across the inside). the stitches are barely noticeable to the untrained eye, but you can see them if you’re looking out. 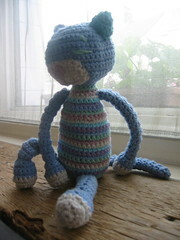 the arm and tail placement is majorly skew-wiffy but i think that adds to his rakish charm. the muzzle is a little low and has come out squarish rather than oval. i’m not overly happy with his features either. i wanted to use some of the different colours of yarn to tie the scheme together, but the green isn’t as much contrast as i’d like for the eyes and the nose is just huge because i couldn’t get the fine control i needed using a blunt yarn needle. it came out all mishapen so i added extra stitches at the top to even it out, so it’s massive, but kinda cute. it sounds as though i’m really unhappy with him but i’m not, i think he’s great. 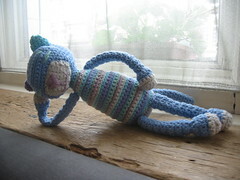 i think i’ll send him for a trip through the washing machine before i hand him over - i’m a little nervous about how well tied off everything is.